This page is intended to provide answers to some of the questions you may have about basic training, obedience competition and tracking with your Borzoi, and provide an overview of the sports. Your new Borzoi has arrived! Whether your new dog is a pup or an adult, male or female, she should learn some basic skills in order to live with you and your family as a well-behaved companion. (We will refer to the dog as 'she' in this pamphlet for simplicity. But both males and females make wonderful pets). Obedience training not only helps to develop a bond with your Borzoi but also will make her a pleasure to live with. The Borzoi was developed centuries ago to hunt wild game. They are classified as "sighthounds" since they primarily use their eyes to locate game for the hunt and chase. In contrast, the "scenthounds" (Beagles, Bassets, Bloodhounds, etc.) primarily use their intense scenting ability to hunt. The Borzoi's combination of great speed and the desire to chase a moving object must be kept in mind when training your Borzoi; this trait can be used to reinforce your dog during training sessions. All early training should be done in an area that is secure (i.e., inside your house, an indoor training facility or within a fenced area). If this is not possible, then your Borzoi should not be taken off lead unless a long line is used. Until your Borzoi has developed a trusting relationship thru training, she will be curious about her surroundings. This is normal. Your first job will be to develop a line of communication with your Borzoi. The safety of your Borzoi must be your first priority. Training your Borzoi should be a joy not a chore. If you approach obedience/rally with the attitude that it provides an opportunity for you to spend time with your Borzoi and as a means of helping you to learn to communicate, then your Borzoi will respond in kind. The happier and more playful your training sessions, the more happily your Borzoi will work. Keep training sessions short, two to three minutes several times a day. Attending group classes is advisable so your Borzoi will learn to follow cues in different venues. But be aware that most Borzoi cannot work for the full hour that most classes are held. Allow a few days for your new Borzoi to become accustomed to her new surroundings, and then begin socialization and training in earnest. If she is not crate trained, begin now, as the crate will be useful when you travel with her and when you need to leave her at home alone, or cannot supervise her activity. The crate will help to make house-training an easier task and will be a great benefit during the teething stage. The clicker website above has some informative articles on how to crate train. Take your Borzoi on walks through your neighborhood to accustom her to different sights and sounds. Take her for a ride in your car and then let her get out at different places and have strangers greet her. If possible, arrange for your pup to play with other puppies of the same age and size. All of this is the beginning stage of training your Borzoi to become a well-adjusted dog whether you are interested in competition or just a family companion. Socialize, but do not terrorize your pup or new adult. If your dog backs off from a new object or person, or startles at a loud noise; don’t force or to ‘face her fears’. Help her thru the scary scenario; give her some distance from the scary stuff. If she continues to be fearful, enlist the help of a certified trainer who uses humane methods. There are specific classes for pups during their critical socialization period (this period is approximately 6 weeks to 16 weeks). Most of these classes allow pups at 8 weeks of age to attend as long as they have their initial vaccines. A responsible breeder will have already introduced the pups to many different sights and sounds before the pup goes home with you. As part of her socialization she should be exposed to different surfaces, other pups and appropriate dogs, children, noises etc. Socialization does not end at 16 weeks, but the critical time frame to accustom your pup to different sights and sounds does. The more your pup is exposed to at an early age, the better she will be able to cope with anything that comes her way. Continue to expose your young Borzoi to something new and different throughout her first year or two. Remember, the Borzoi pup seems to grow in leaps and bounds and during an awkward growing stage she may not be able to sit promptly on command, or she may sit crooked in what is called the "puppy sit." Going into the down position may take longer. Holding a stand may be nearly impossible. Be patient. This long-legged awkward stage will pass and is just part of puppyhood. Another growth period to be aware of is the teething stage, 4 - 5 months of age. Concentration may waver and what seemed like a simple task the week before, may be impossible the next. Again, this stage will pass. Socialization should still continue during this stage, but any intense training should be put on hold. Jumps at a very low height can be introduced at a young age but an immature dog should NOT be required to jump full height. Puppies can be taught to walk through the jump stanchions, with no boards or bar in place. This accustoms them to the "jump" for future training. Eventually a 2 or 4 inch board can be put in place for the puppy to walk over, do recalls over, or chase and retrieve toys over. Full jump height should not be attempted until the dog is physically mature (about 2 years of age). Take your older puppy or adult dog to a family manners class. Basic cues are taught by incorporating games into the training. Remember that training should be fun for both of you. Before signing up for any class, go and observe a class or two. Are you comfortable with the instructor? Does he/she have time for each student? A class of 20 or 30 dogs with one instructor is no place to learn and is unfair to you and your dog. A good ratio is one instructor to no more than 5 or 6 dogs. Find a class that teaches by positive reinforcement. Stay away from an instructor that teaches by yelling and jerking the dogs by their collars, these are old-fashioned methods and is not the way to open the line of communication with your dog, nor develop a trusting relationship. Borzoi are sensitive and do better with positive training methods. You, the owner, should train the dog. Do not send her away for obedience training. Teaching your own dog helps develop a bond between you and your Borzoi and increases your enjoyment of owning a well-behaved companion. It is important to practice what you have been shown in class daily. Practice in an environment with little distraction until your Borzoi can respond on your first cue. Then slowly add distractions to increase her confidence and reliability on each command. A distraction can be a stuffed toy on the ground next to her when she is doing a down stay, or merely another person standing in the room. The sighthound is alert to each and every change in her environment and it is only fair to increase the level of difficulty slowly and fairly. Be patient, Borzoi seem to work best with short (2 to 3 minute sessions), take a break and play a game of tug, or reload your training treats or throw a toy. Then begin another rep of training. Take play breaks during class. Training can be included in your daily routine. Have her sit for her food, have her sit while you put on her leash or have her wait while you open the door. Being comfortable in a crate is relatively easy to teach your Borzoi. Borzoi usually enjoy their own little haven. Begin by putting the crate in the room in which you spend the most time with your dog, with the door always open. At mealtime, place her food dish in the crate, she will most likely move towards the crate at which time you can add a cue such as "crate" or "kennel up" and allow her to go in the crate and eat. Don't close the crate door at all initially. After a few days you can begin closing the door when she seems comfortable entering on her own. She must go in on her own; don't force her. Give her a stuffed interactive toy such as a Kong, a Kibble Nibble ball, or a Twist n Treat, this will keep her occupied and give her something to do while she is in her crate. She will enjoy her crate time and you will have the peace of mind that she is safe while you are not at home or while traveling with your Borzoi. Having your Borzoi come when called is one of the most important lessons she will ever learn. To accomplish this, your Borzoi must think that running to you is the most fun she's ever had. Leslie Nelson’s Really Reliable Recall - Watching the video is a wonderful way to teach your dog to come when called. Goals may be different for each of us: a well-behaved companion or a dog who can compete for AKC titles in obedience. Many obedience classes offer a Canine Good Citizen (CGC) class and test. The CGC consists of 10 tests demonstrating that your dog understands the basic commands and that you, the owner/handler are a responsible dog owner. Precision is not required, but control of and confidence in your dog are. This is a great place to start earning titles. Information here. Another place to begin earning titles is in Rally. The Novice level is all on lead! You can talk to your dog as you guide her through the course that consists of signs such as 'sit your dog,' 'stand your dog and walk around her'. After Novice there is the Advanced, then the Excellent class, both off-lead. For more information on AKC Rally, click here. Obedience takes more precision then Rally. 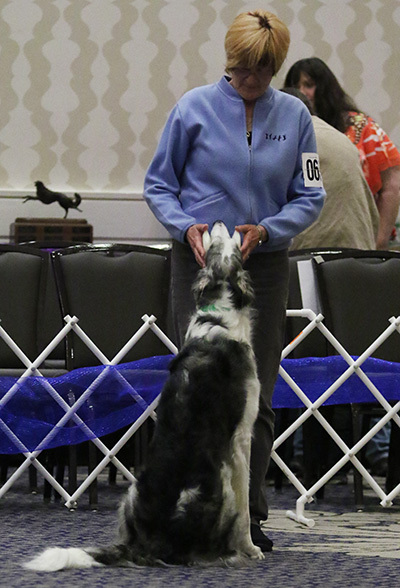 The beginning level where you can earn a CD (Companion Dog) title after three qualifying scores is partially on-lead and partially off-lead. The CDX (Companion Dog level and UD and UDX level are entirely off-lead. Many Borzoi have reached the higher levels, it just takes lots of practice and patience. In recent years, many optional titles have been added to Obedience. You may enter these optional classes at any time during your progression from the CD, CDX, UD and UDX titles. Several of these optional classes are on-lead. For more info: click here. Your Borzoi must be registered with the AKC and must be at least 6 month old to enter an AKC obedience or rally trial. If your Borzoi was obtained without registration papers you can apply to the AKC for registration as long as she is neutered. Even though the Borzoi is a "sighthound," they can be trained to recognize and follow human scent. 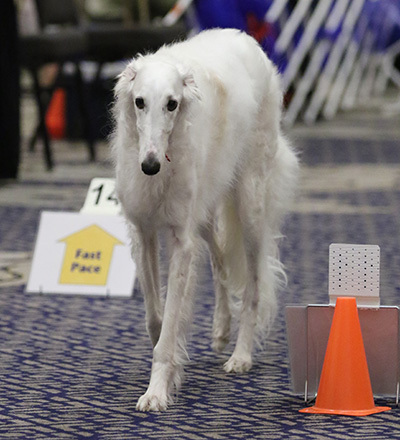 Your Borzoi needs to pass a tracking test only once at each level in order to earn the associated tracking title offered by AKC. The Tracking Dog (TD); Tracking Dog Urban (TDU); Tracking Dog Excellent (TDX); and Variable Surface Tracking (VST) titles go after the dog's registered name. The Champion Tracker (CT) title, which goes in front of the dog's registered name, is awarded to a dog that earns all three TD (or TDU) plus TDX and VST titles. For more info on obedience and rally: https://www.akc.org/events/obedience/getting_started.cfm or write the AKC, 5580 Centerview Drive, Raleigh NC 27606-3390. Agility Right From the Start by Eva Bertilsson and Emelie Johnson Vegh. Although this book is for agility, the foundation skills discussed are wonderful for even the family companion.